I believe it was early July 2010 when I brought my friend and fishing partner, Mark, for his first taste of Rhode Island trout fishing. Our destination, the Wood River, holds a special place in my fly fishing memories. I hooked my trout on a fly from the banks of the Wood when I was thirteen years old. I don't get back there often enough, but I look forward to making a few trips a year. Nowadays, almost all of my trips to the Wood happen during a magical time of early summer. The hot and muggy New England weather triggers the Wood's mega hatch of Hexegenia Limbata mayflies. The Hex is North America's largest species of mayfly. The hatch occurs after dark, sometimes coming and going in the blink of an eye. A good Hex hatch is about as exciting as trout fishing gets for me. I love casting big, bushy dries to the sounds of rising trout. Who needs to see rises when you can hear them so clearly? I hate to drive all the way to the Wood for what could potentially be as little as a half hour of Hex fishing. To maximize my time and gas money, I like to spend the afternoon chasing the Wood's other attraction, the native brook trout. 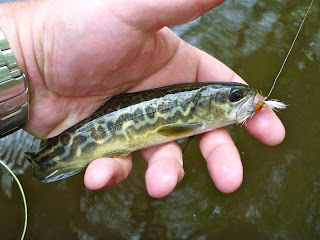 I love small stream trout fishing and the Wood (and its tributaries) has enough brookies to keep an angler busy until darkness falls, the Hex begins to emerge, and the stream's larger inhabitants come out of hiding. Mark is a brook trout junkie and my usual routine sounded good to him. I was going to share the Wood and its residents with Mark, but little did I know Mark had something to share with me. He gave me one of his favorite brook trout flies, a #12 Ausable Bomber. Created by the late Fran Betters, this Adirondack dry fly has become a staple of the small stream trout fisherman's arsenal. It did not take me long to catch several brookies on Mark's Bomber. Since that day, I never leave home without several Ausable Bombers, as well as its sister pattern, the Ausable Wulff. Both have proven equally effective for me, so I can't say I prefer one or the other. The Ausable Wulff is tied on the tried and true Wulff template. It's not a new fly to salmon fishermen. I recall seeing it in my all time favorite book on the subject of Atlantic salmon fishing, Fishing Atlantic Salmon: The Flies and the Patterns (Bates and Bates Richards, 1996). Though it's currently out of print and it sells for a relatively hefty sum, it's worth every penny. Anyhow, a small Ausable Wulff (tied by Betters) makes an appearance on page 182. I've never heard anyone mention that they've hooked an Atlantic salmon on an Ausable Wulff, however, it looks like it has a lot of potential for Atlantic salmon in rivers with tannin colored water. The same goes for the Ausable Bomber. I decided to tie the two in what would be considered very large sizes for these particular flies. If the planets and stars align just right for me, I really hope to try these out in Newfoundland this summer. I think they'd be a pair of killer flies for the surface oriented salmon of "The Rock." I modified the dressings a tiny bit from the originals, but will make note of what Betters' used to tie these two flies. I'd be curious to know if anyone has had success with either of these on a salmon river, so please let me know. If you have a chance, check out my friend Mark's fantastic blog, Fishing Small Streams. While I have been up to my ears in dirty diapers lately, Mark has been knocking them dead on local streams!